Get the best recipes and reviews for your next baking day! If you know me then you know my favorite part of the year to cook for is football games… especially the Superbowl! I love-making snacky foods that are only acceptable to eat one day out the year! The following recipe is one I got while working in a kitchen during a part of my hospitality life time. If you know how to make wings you can make this recipe… I’m just letting you in on a little recipe secret that you would not have expected! Start by preheating the oven to 400 Degrees (F). 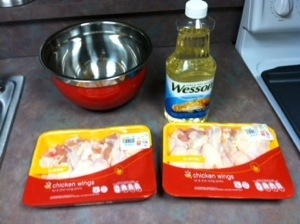 Put the chicken wings in a big mixing bowl and combine the vegetable oil, about 2-Tblsp. for every 12-wings. They should be glossy and coated! 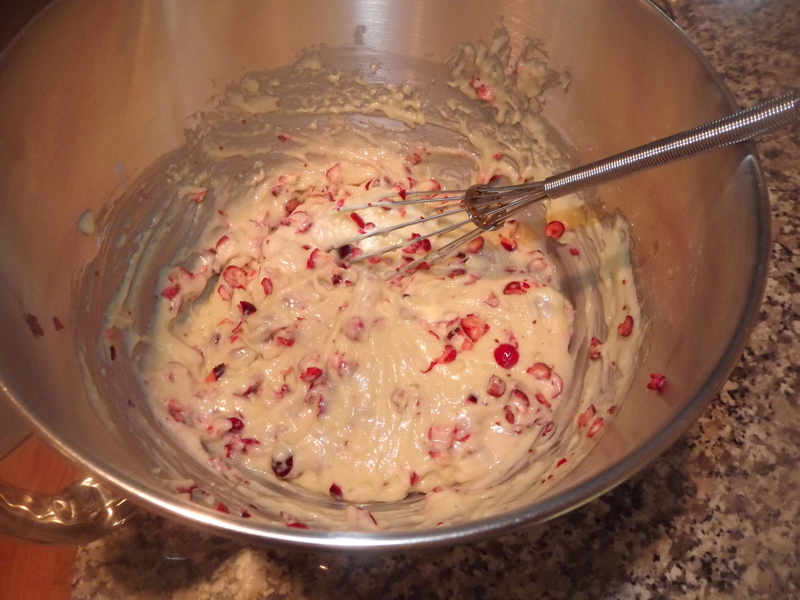 Then add the flour, about 4-Tblsp. 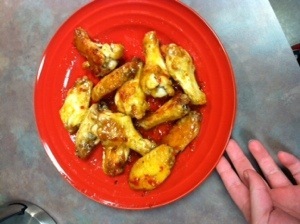 for every 12-wings, again coated but they shouldn’t be flour white. 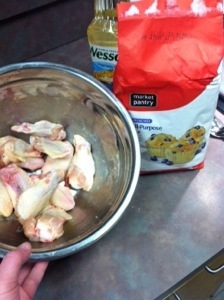 Then spread the chicken out on an ungreased baking sheet and cook for about 40-50 Minutes. They should be golden and crispy. Here it comes, the secret ingredient! 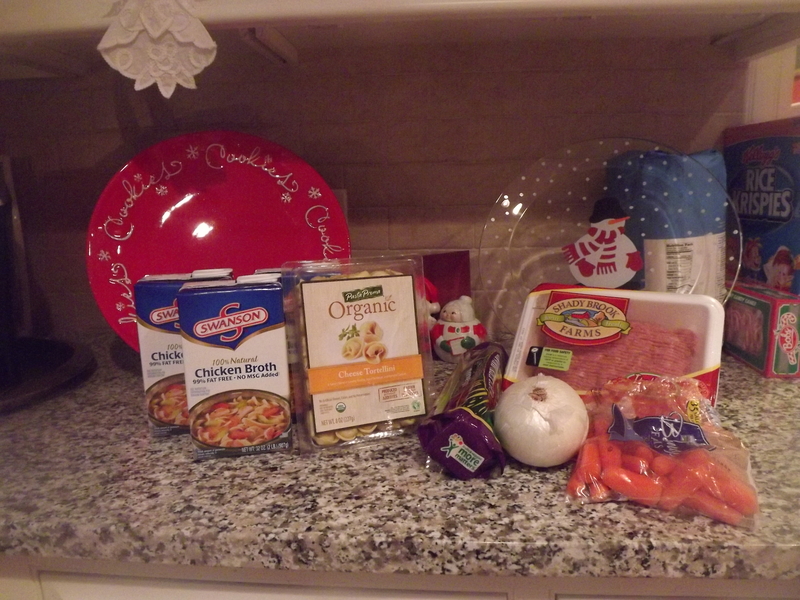 If you ever go to the grocery store and are an avid shopper like myself (I love the grocery store!) then maybe you have seen this ingredient in the Asian aisle, on the top shelf (at least in Stop & Shop it is). Okay are you ready?! 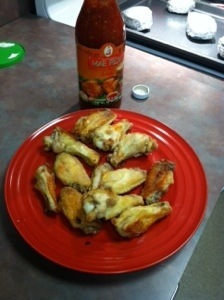 This is the perfect combination of sweet and spicy and I will never eat a plain chicken wing again after discovering this sauce! You can add this to your chicken wings one of two ways, either pour it on the wings and leave on a plate and only some get covered slightly, OR, put the chicken wings in a mixing bowl again and pour about 1/2 Cup for every 12-Wings in and toss them around to become evenly coated. I promise these will be the hit of your Superbowl party! The saying goes “Friends come and go but Family is forever” and if that’s the case I gained another family when I met Nicole, her family welcomed me into their home on numerous occasions and have been great in introducing me to home cooking and delicious new recipes. Nicole has a family I dreamed of, her mom is one of those Italian Mama’s that cooks for hundreds when she does and Nicole always brought back leftovers to school for us to enjoy! I loved having Nicole around because she got her mom’s cooking skills and always made delicious meals for us! I always made dessert, it was the perfect combination! 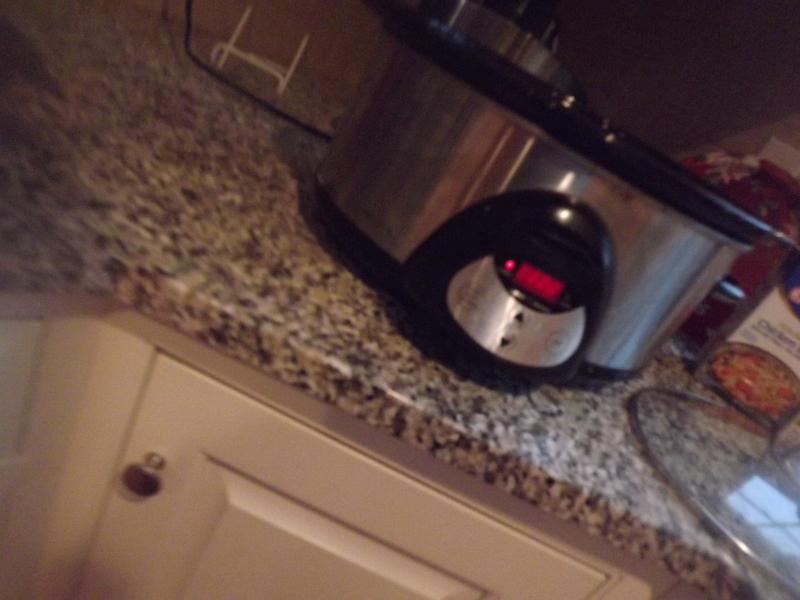 The amounts are going to vary based on personal preference and the size of the crock pot. Get out the crock pot and start by pouring the chicken broth into the pot. 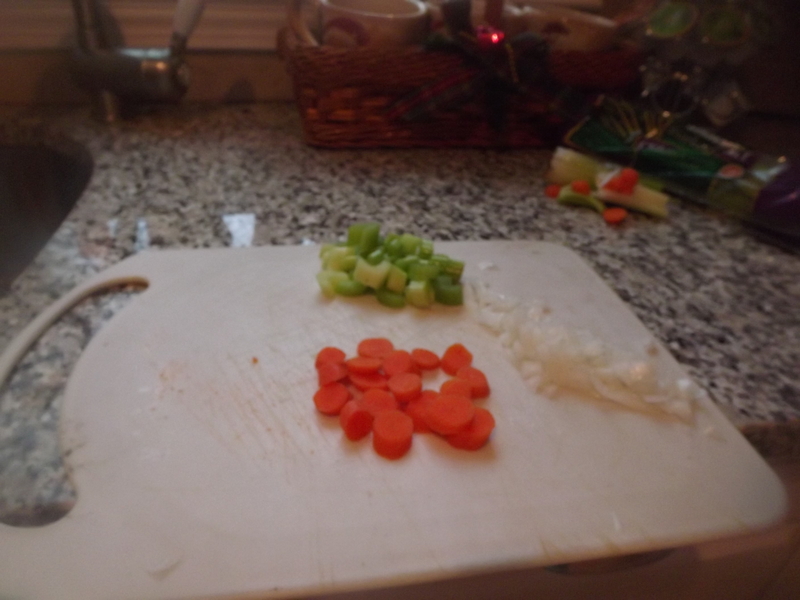 Then chop up the veggies add as much or as little as you would like! 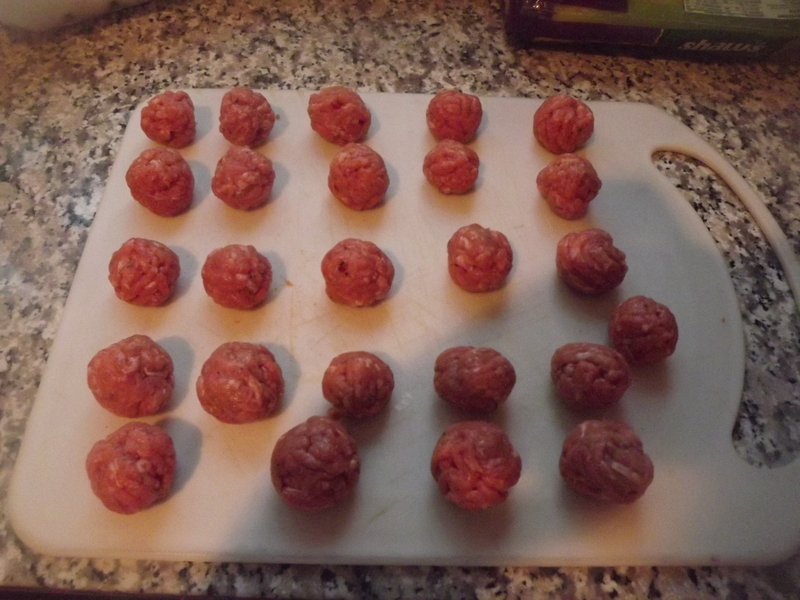 Once those are complete and in the pot you can grab your ground turkey and start rolling it into little meatballs. 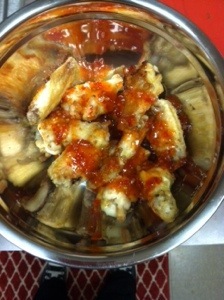 Once those are done toss them into the pot and turn your crock pot onto “LOW” for 6 Hours! 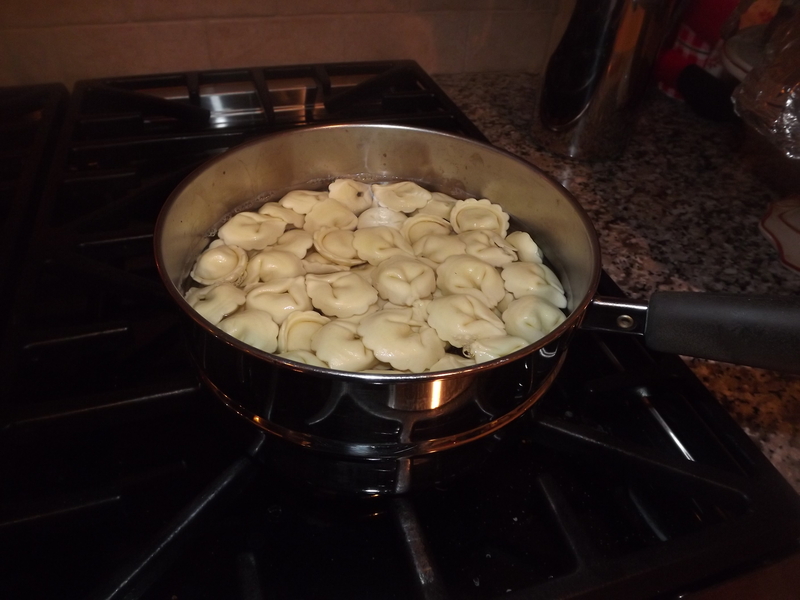 Once the soup it complete on the stove top you can make your tortellinis by the package directions. Then add them to your crock pot and you are ready to enjoy! This is so simple to make in the morning and enjoy after work. I hope your family enjoys it as much as my family does. A special “Thank You” to the Pinkham Family for welcoming me into their home 6 years ago and making me feel like family! I think it has been established that I love baking with cinnamon and sugar… and well snickerdoodles are the perfect combination of both these ingredients! This past weekend my mom and I had a few Christmas parties to attend so we thought it’d be nice and maybe even beneficial to my blog 😉 to bring a few sweet treats! 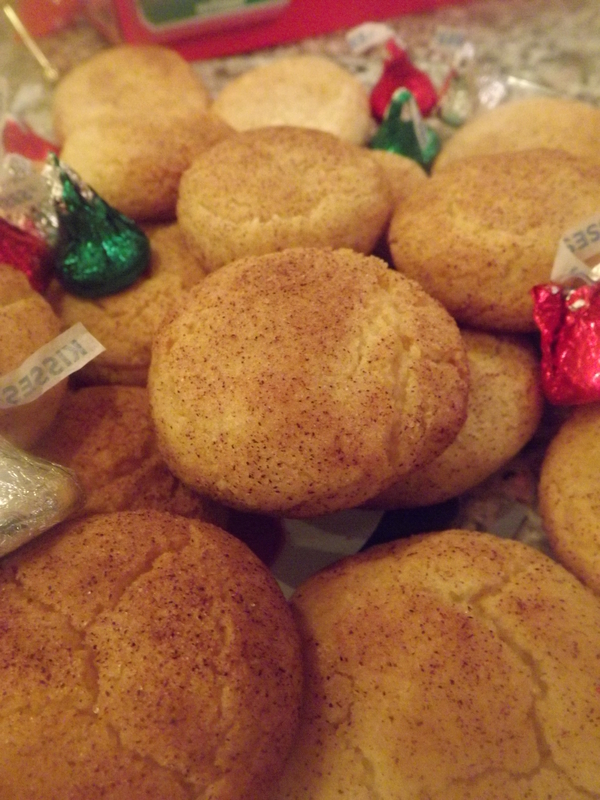 These snickerdoodle cookies came out so perfectly! They are delicious on the outside and nice and soft and chewy on the inside. Please enjoy with your family, or by yourself because you may not want to share! 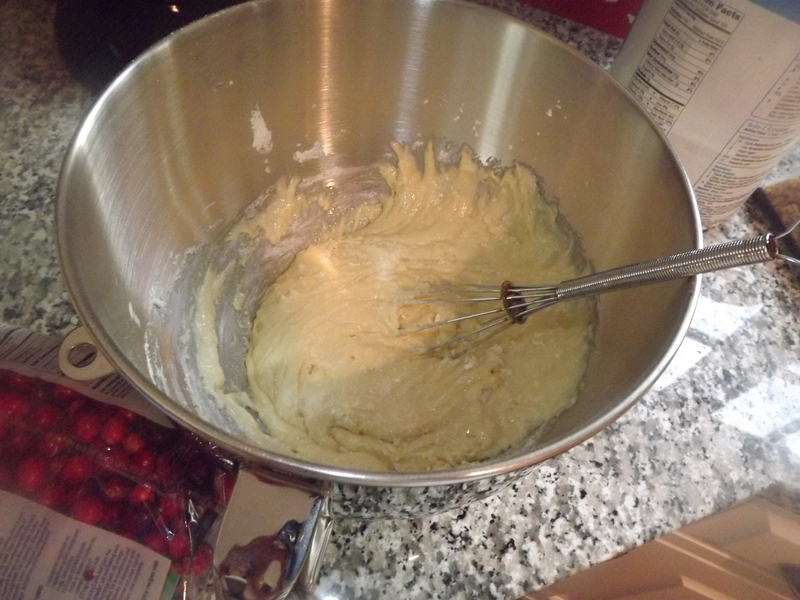 In a medium bowl start by beating the butter with an electric mixer for 30 seconds. Add the 1 Cup sugar, baking soda, and cream of tartar. 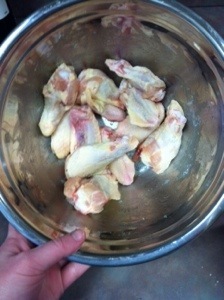 Beat until combined, scrape the edge of the bowl when necessary. Beat in the egg and vanilla until combined. 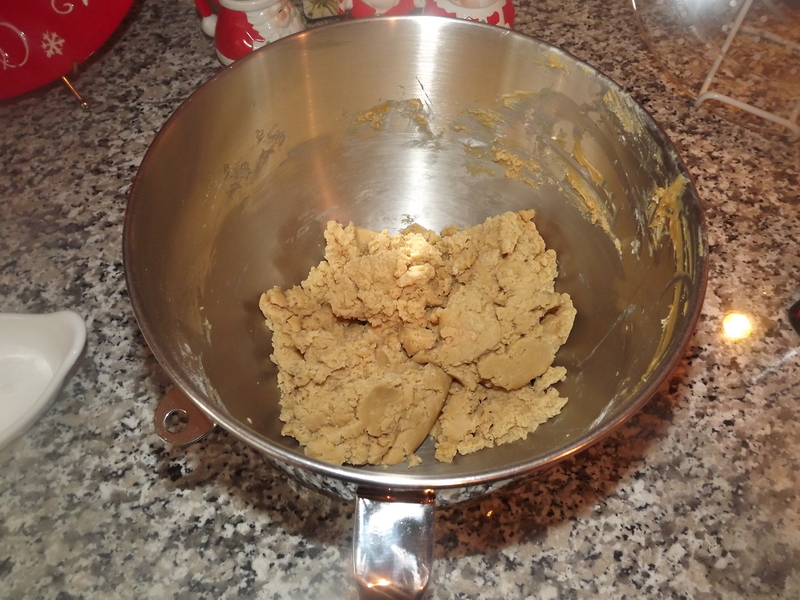 Then add the flour slowly with the mixer, if you are unable to mix all of the flour in with the electric mixer you can use a spoon, or the fun version, your hands! Let the dough chill while covered for an hour. Preheat the oven to 375 Degrees (F). 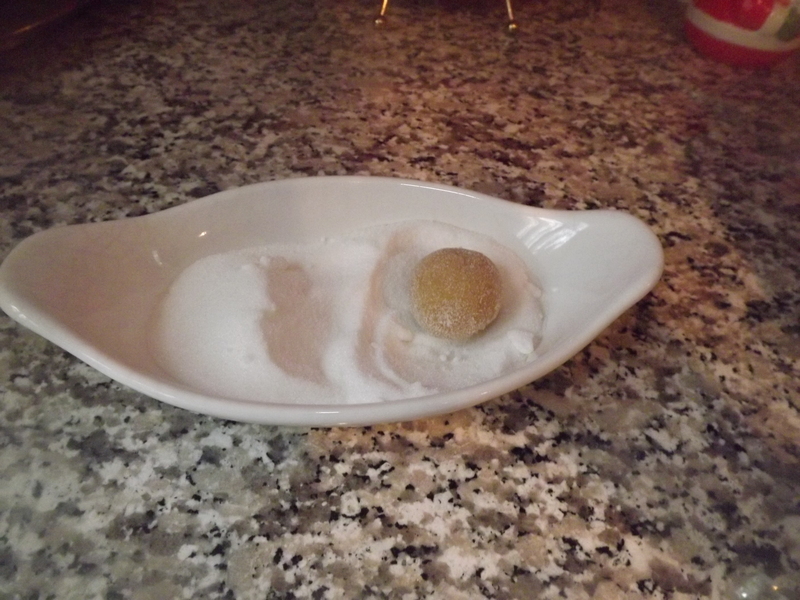 In a small bowl combine the 2 Tablespoons of sugar and cinnamon. 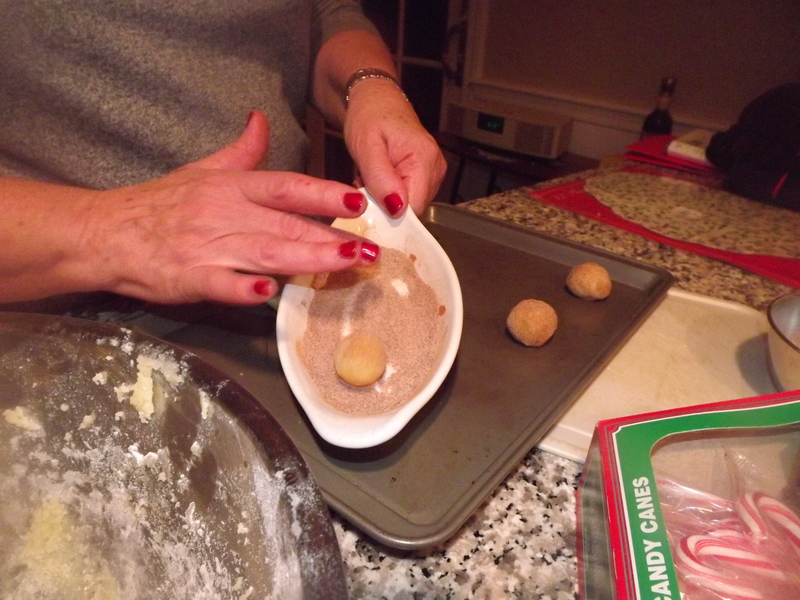 Shape the dough into 1-inch balls. 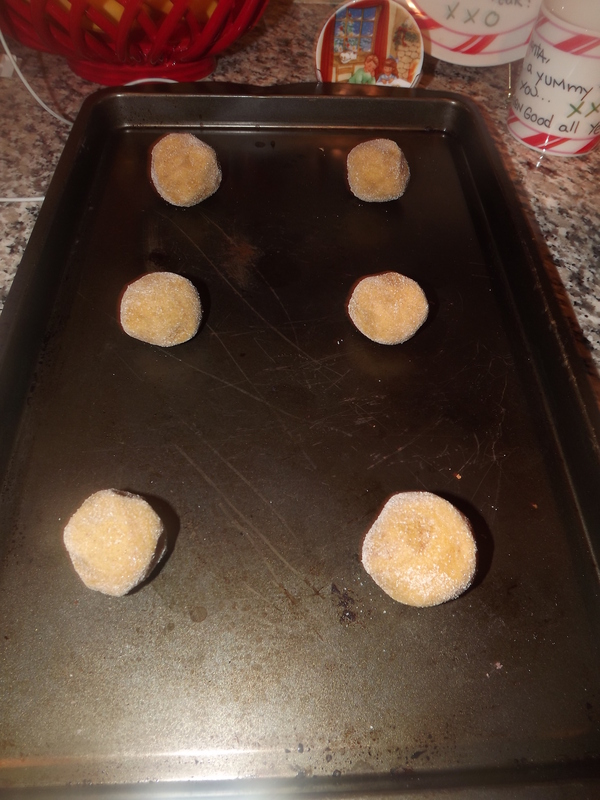 Roll in the cinnamon-sugar mixture and place 2 inches apart on an ungreased cookie sheet. Bake for 10-11 minutes until golden. Let cool. Should make about 30 cookies. Today I will not be posting a recipe… I know I’m really sorry! But instead I will be sharing some of the other amazing blogs I read by some of my really close friends. High school was an amazing time for me but I only had three best friends I’ll keep for life and remember forever, and they are doing amazing things with their lives right now! One got married and is a teacher and the other is living it up in Washington D.C, and both my have a recipe or two to share this month. The second blog I’m sharing is a friend I met way to late in college. Carly and I didn’t met until our senior year of college, not quite sure how this happened (it’s not like we went to a huge college or anything). But I was lucky enough to meet her at all. Carly has this fullness on life attitude and has turned it into a blog. She shares healthy recipes (what are those?!) but she also shares ways to live a fuller life, minus fear, and more giving. It’s a really interesting blog that I enjoy and definitely gets me thinking about how I live my life and how I could be living my life. Please enjoy these blogs as I do and feel free to share with your friends! Thank you to my followers for being my major supporters and my motivation to hopefully have a huge surprise come 2014! 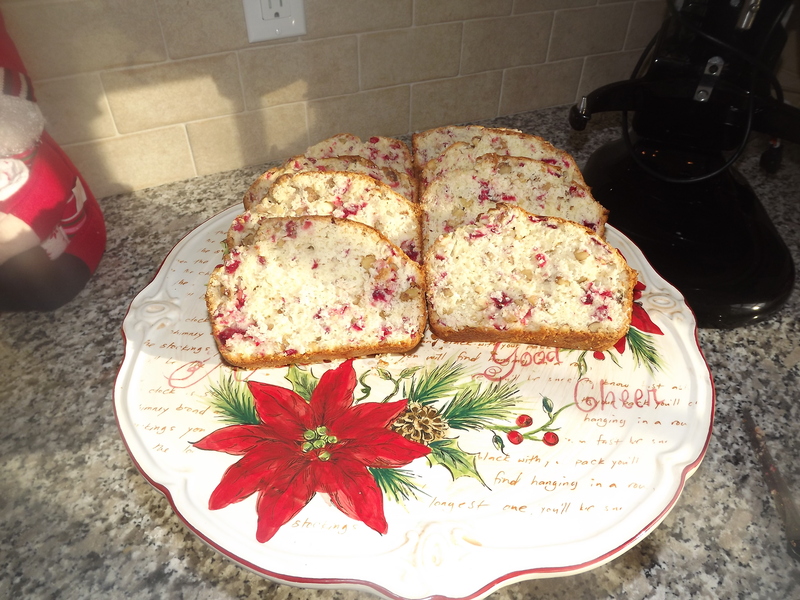 But continue to follow in 2013 for more great holiday recipes! 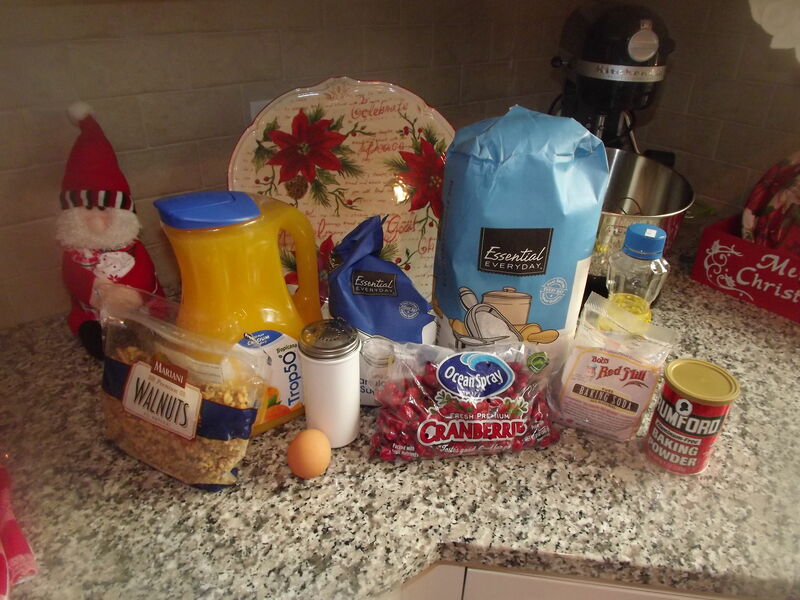 Christmas is coming and what better way to wake-up than with a breakfast already prepared the night before! According to Ocean Spray “cranberry are the unofficial-official fruit for the holidays” so I have decided to try a new recipe! 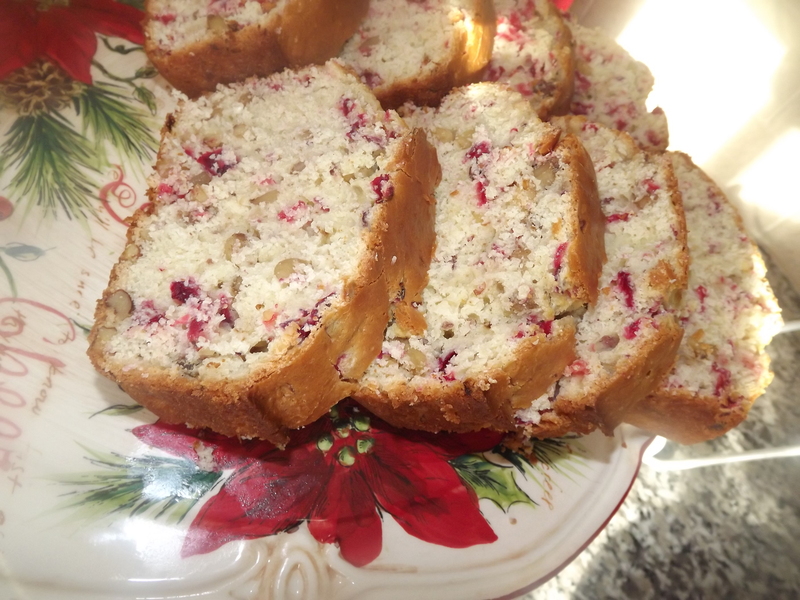 The nuts are always optional but I made a cranberry nut bread today, this is my first time and I have had one great review from my mom who had it with a little tea as her morning snack. 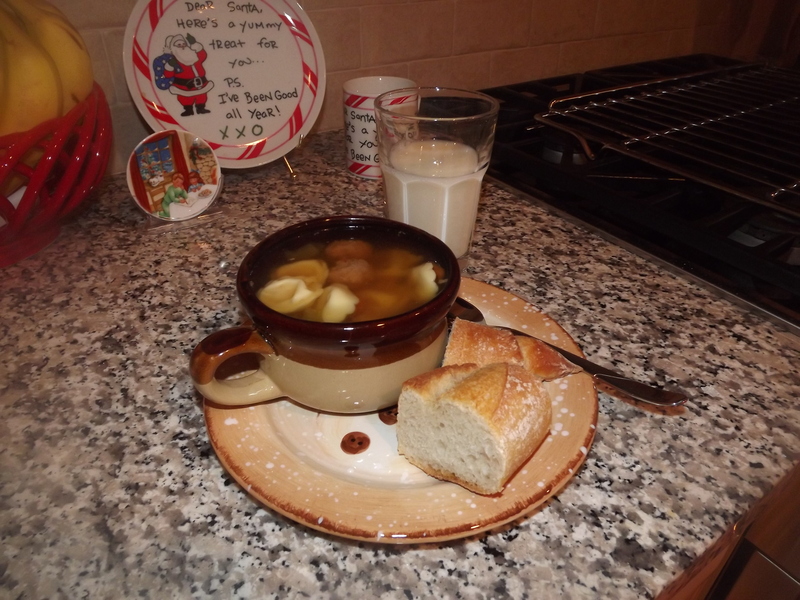 Please leave a comment if you have tried this recipe and fully enjoyed it! Preheat oven to 350 Degrees (F). Grease a loaf pan (I used a 9×5). 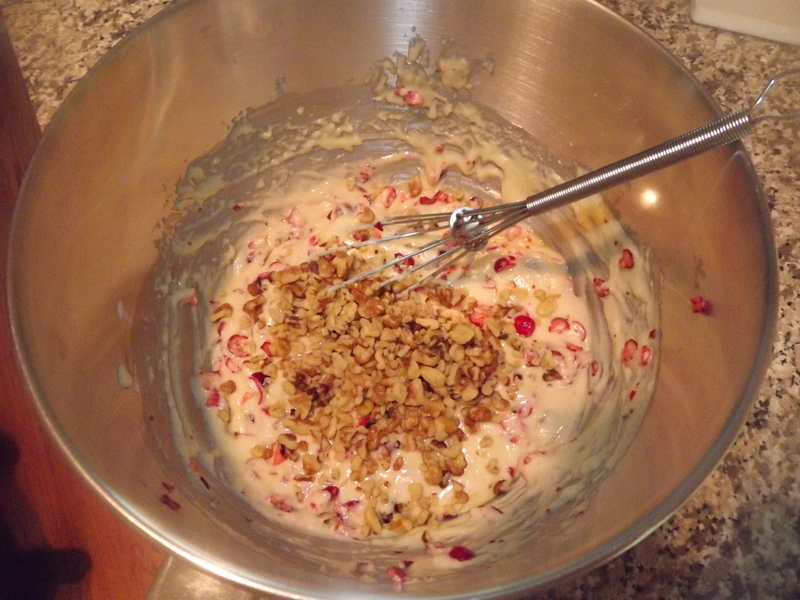 Mix in a medium bowl all of the dry ingredients. Then add the orange juice (Mix) then the egg (mix). Mix all those ingredients together until it is well combined. 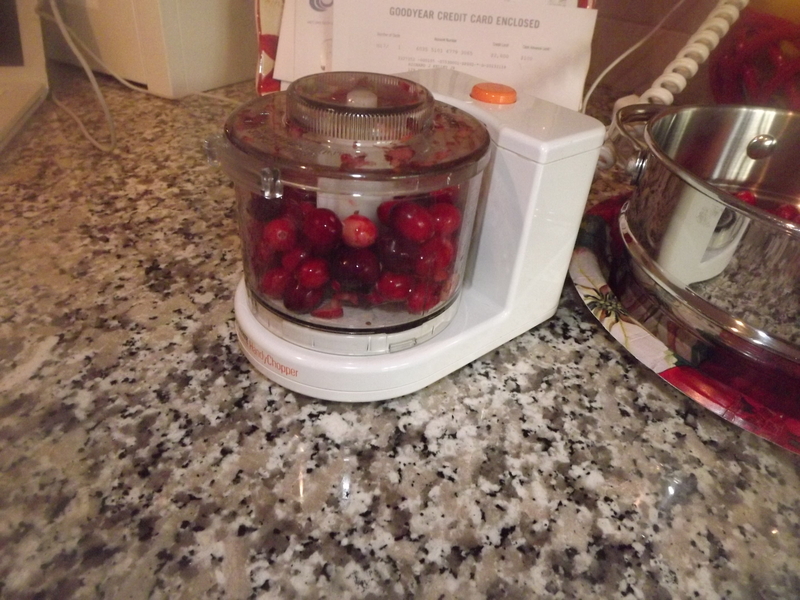 Then stir in the cranberries and nuts. I used a little handy chopper from Black and Decker to make this process go a little faster, but a good ole’ knife and cutting board will do the trick too. Pour into the *Greased loaf pan and bake for 40 minutes (this time can alter based on your oven). Best trick in the book take a toothpick and check the middle in order to see if it comes out clean. Once the bread has finished let cool for about 15 minutes. Then flip it over and place it on a decorative plate, you could even have it sliced up already for easy pickin’. Grab your coffee or tea and enjoy! These are amazing! Growing up on Martha’s Vineyard I was a slight tourist and enjoyed my occasional trip to the Black Dog Cafe for their amazingly delicious Giant Chewy Ginger Cookies! They were so good that as I continued to get older and more familiar with the idea of baking and how ingredients worked and even looked up different recipes for ginger cookies I finally discovered one that was perfect! *My only issue is that they are delicious the first two days soft chewy moist everything you want in a cookie, however, once you hit day three they start to turn into “Giant Ginger-SNAPS” because they are a little harder. Be advised if you decide to bring them to a party. Preheat the oven to 350 Degrees (F). Then start mixing the flour, ginger, baking soda, cinnamon cloves and a pinch of salt together. Set that aside. You will need two bowls for this recipe or you can do the second part of this recipe and then throw in the dry ingredients after, as long as it all makes it into one bowl it doesn’t matter how it’s combined. In the second bowl start with the shortening and beat that till it’s creamy (30 seconds). Add the 2 Cups of granulated sugar then mix till they are well combined. Beat in the eggs and molasses until well combined again. *I hate the smell of molasses don’t let that turn you off from this recipe. While mixing you may not enjoy the smell of these ingredients together but they taste so good together once they are baked! Start to stir in the flour mixture until it’s fully mixed. In order to make these cookies “Giant” use an ice cream scoop, but take half of that scoop and make a ball. 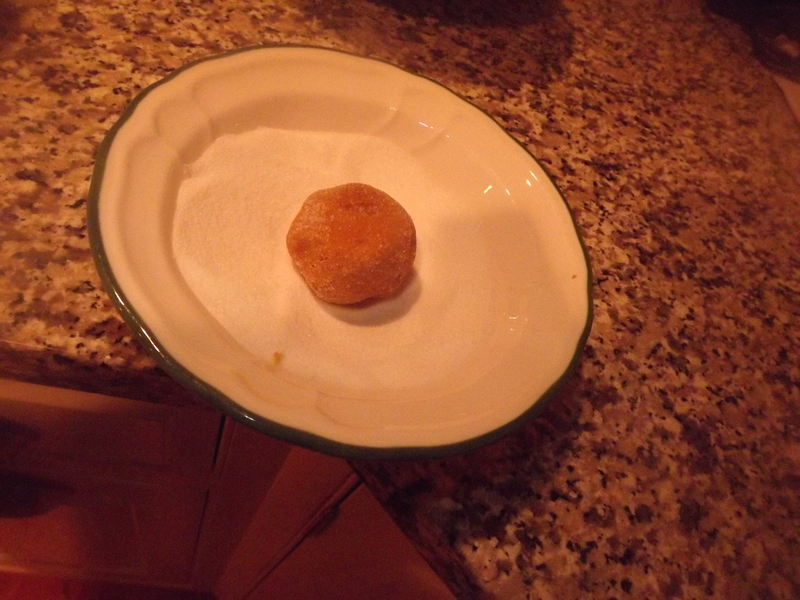 Once you have a ball of cookie dough roll it around in the coarse or granulated sugar. Then place the balls on an ungreased cookie sheet. Bake for 12-14 Minutes until the cookies are light brown and puffed. Be very careful not to over bake or you will never get the chewy cookie it will go straight into a ginger-snap. Let cookies cool and then enjoy! These are another great cookie to bring to a swap because this recipe will make about 25 cookies. This is a family favorite, I don’t know anyone who doesn’t already make these. When I was younger my mom and I would host this amazing Mother/Daughter cookie swap with a Yankee swap involved. It was always a blast for me because I knew at a young age I enjoyed baking and I loved finding new recipes for this event each year near Christmas. I don’t make mine any different from others… Unless of course you buy a bag of Peanut Butter cookies from Betty Crocker, in which I do make it differently because I do all my own measuring. 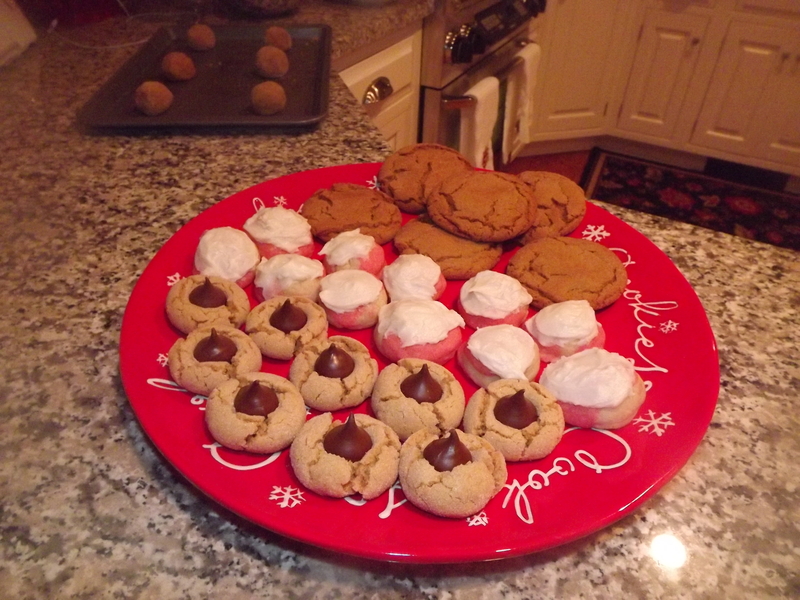 So here it is, the family favorite Peanut Butter Blossoms. These don’t take long to mix up, so start by preheating the oven to 350 (F) Degrees. In a large bowl start with the shortening and peanut butter and mix till it’s creamy (you will need an electric mixer for this recipe.) 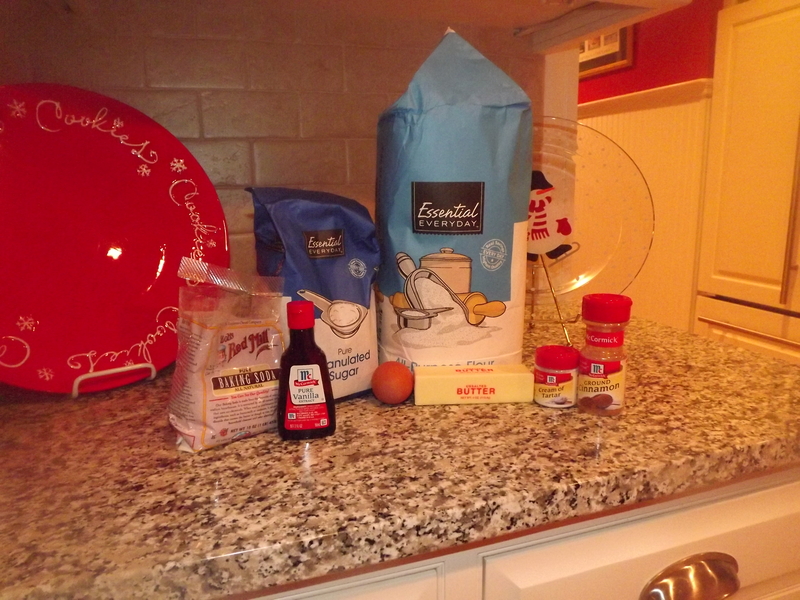 Once that’s mixed add the 1/2 cup of granulated sugar along with the brown sugar, baking powder, and baking soda. 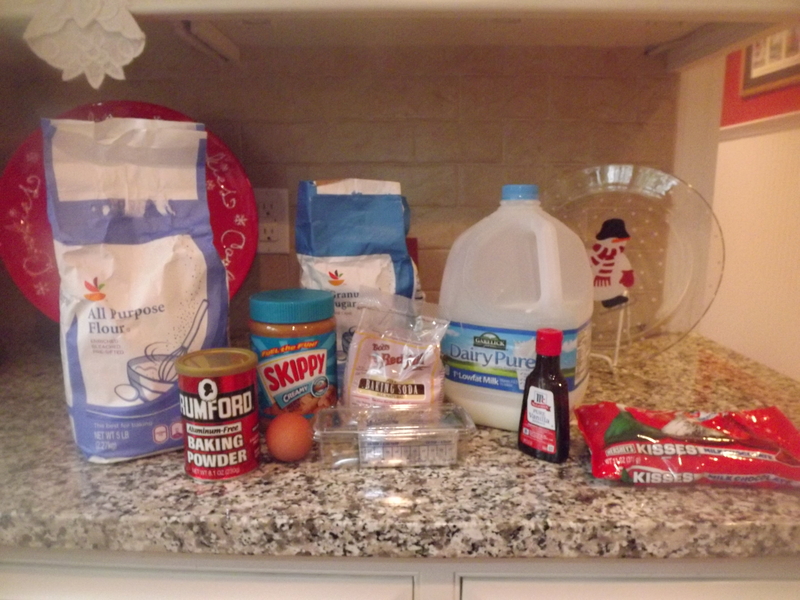 Mix it up then add the egg, milk, and vanilla. Last step mix in the flour gradually. Doesn’t it smell delicious?! Once it’s all mixed in together start shaping the dough into 1-inch. balls. 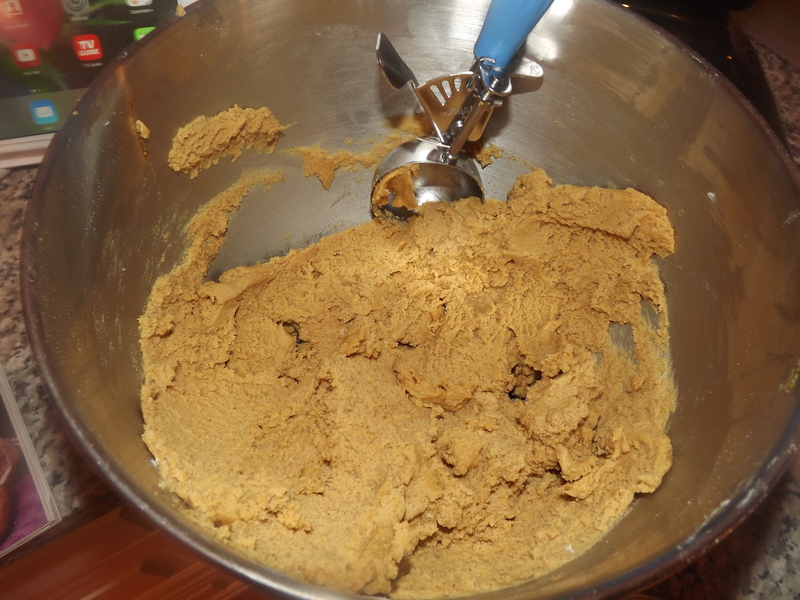 Before placing the dough on the ungreased cookie sheet give it a spin in the 1/4 cup granulated sugar. 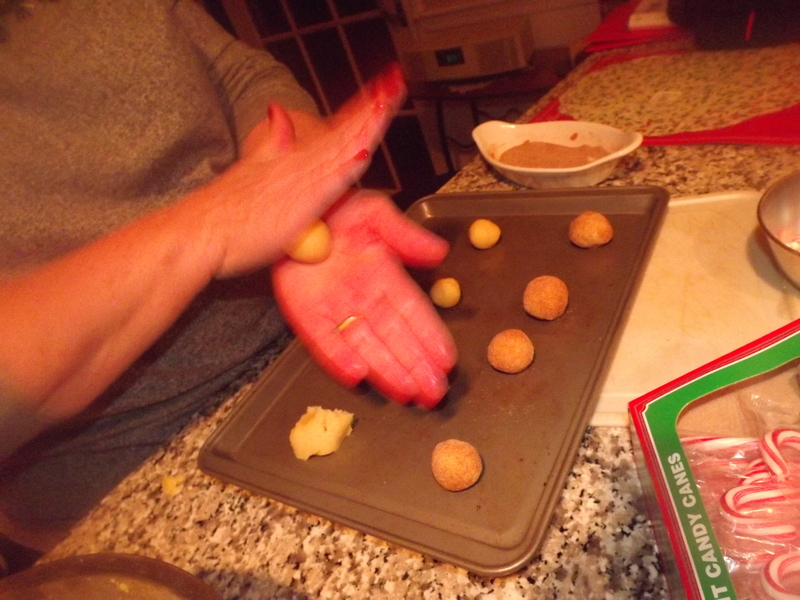 Once the balls are coated and on the baking sheet send them into the oven! Bake for about 10-12 minutes. While these are baking you and your little elf can start to unwrap some hershey kisses. This recipe should make about 30 cookies. 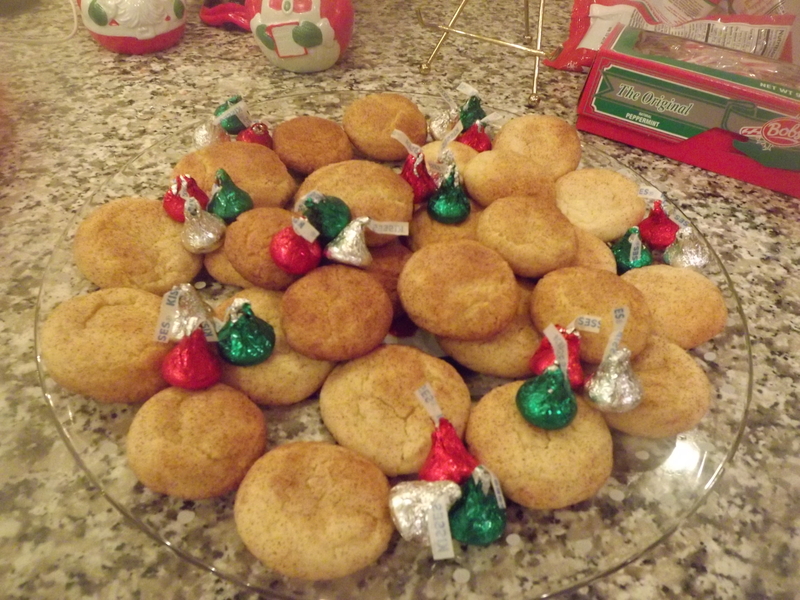 As soon as the cookies come out of the oven press a kiss into the center and let them cool. It will be tempting to try it right away but be patient and pour a glass of milk in the mean time. *If traveling or bringing to a party place in layers separated by wax paper in an air tight container. These cookies can last up to 3 days in room temperature or frozen up to 3 months. I promise you they will not last that long anyways. Check back later this week to see what else is on the plate!